"Next summer - the fear goes deeper." Entertainment Studios Motion Pictures has debuted the first teaser trailer for 47 Meters Down: The Next Chapter, shamelessly riding on the coattails of this year's shark movie The Meg, in theaters this weekend. 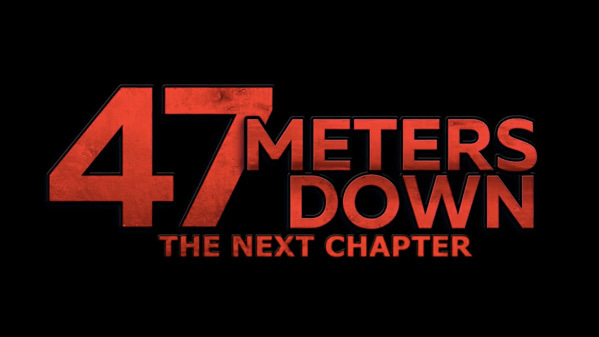 This was originally supposed to be titled 48 Meters Down, obviously enough, but they got cold feet and have decided to call it 47 Meters Down: The Next Chapter - which is an unbelievably lame title for a sequel. The cast hasn't been revealed yet. The film's director says he "would describe it as The Descent underwater," about "six or seven people trapped in the caves in Brazil, an underwater city." With an angry shark, of course. This looks so awfully cheesy, I don't even care to see more. The official sequel to Johannes Roberts' 47 Meters Down, the "smash summer hit of 2017". 47 Meters Down: The Next Chapter, or also 48 Meters Down, follows five backpackers who go diving in a ruined underwater city and quickly learn they are not alone in the submerged caves. 47 Meters Down: The Next Chapter is again directed by English filmmaker Johannes Roberts, director of the first movie 47 Meters Down, as well as Sanitarium, Hellbreeder, Darkhunters, Forest of the Damned, The Expelled, Storage 24, The Other Side of the Door, and The Strangers: Prey at Night previously. The screenplay is written by Ernest Riera and Johannes Roberts. Entertainment Studios will release 47 Meters Down: The Next Chapter on June 28th, 2019 next summer - a bit less than a year from now. First impression? What do you think?